Wow! Three weeks from tomorrow the minor-league baseball season ends. That’s a hard thing to fathom. I am not really sure I am ready for that. When it comes to teaching, I am not sure I am ready for that, either. This past week, I set up my classroom and come Wednesday, I have the first of two institute days. The kids arrive for their first day on Friday the 17th. Then, the month begins to take off. Then MiLB Playoffs will be kicking off soon. Tennessee is still holding on. Heading into today, the Smokies are 5.5 games back. South Bend is fading very fast. They are seven games back. South Bend is going to need an incredible run and some help to get over five teams. Eugene has an excellent shot of joining Mesa in the postseason. They are just two games behind Salem Kaiser. The Cubs 2 team in Mesa is very quietly moving up the ladder. They now stand 1 games behind first place. However, that division is so jumbled with five teams within 2 games of the lead. Mesa’s season ends a week early on the 27th. This past week, Baseball America released their rankings of the top farm systems in the minors. The Cubs came in at #28. Even though Miguel Amaya made two top 100 lists, the system itself still lacks elite talent. BA, however, did mention both Nico Hoerner and Brailyn Marquez as possible players who should be ones to watch next year. 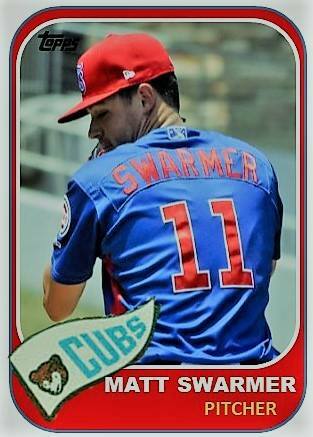 Even though there are three weeks still left in the season, Jared Young seems to have sewn up the Cubs’ Minor League Player of the Year Award. He won back-to-back monthly awards in June and July. Aside from hitting .306 with a .368 OBP for the year, Young hit his 15th HR on Friday while also crossing the 70 RBI plateau. Young has completely dominated two levels at South Bend and Myrtle Beach. 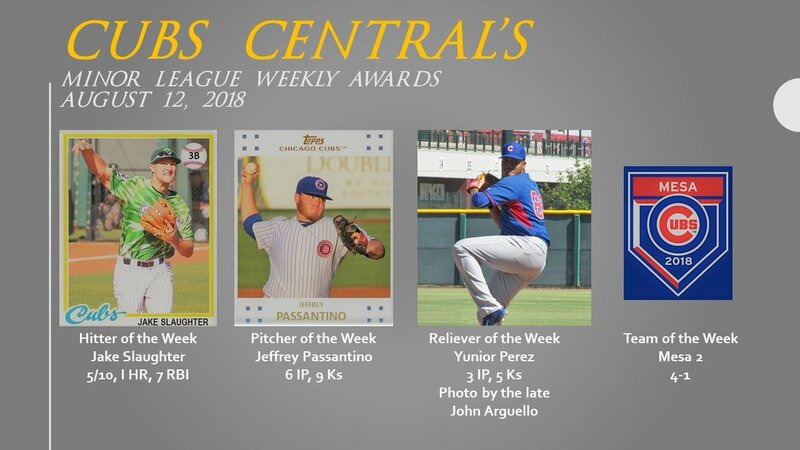 The only player who is even in the same discussion for the award is Jason Vosler, who leads the Cubs’ system in both HRs and RBI with 18 and 73. On Friday night, it was strange seeing Trevor Clifton throw a no-hitter for 5.2 IP. He gave up 2 consecutive hits before he was pulled. 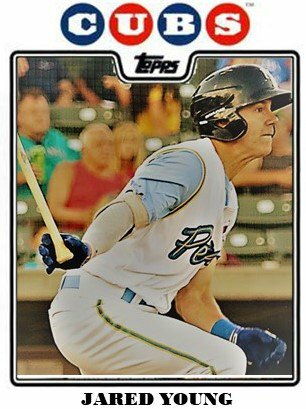 All the while, I kept thinking, “I only have one more baseball card to make of him and that is from his MLB debut.” Got a little misty thinking about his journey and how close he is to getting the call to Chicago. Every summer down in the Dominican, one prospect usually garners a lot of inquiry about their stat line. Last year, that prospect was Fernando Kelli who stole 58 bases. This year, pitcher Luis Rodriguez is raising some eyebrows. For the season, he has a 0.70 ERA and 0.70 WHIP in 51.1 innings. He’s struck out 46 and walked only 6 all summer. Even more impressive, as a starter, he has a 0.24 ERA!!!! I was hoping the 18-year-old lefty gets a shot to come north to play in Mesa once his team is eliminated from the DSL playoffs. Zack Short is killing it AA the past month. The 23-year-old shortstop is doing what he normally does – hitting dingers and taking walks. But this year, he’s had a couple streaks where he’s hit about .300 for long stretches at a time. He’s in one of those runs now (9 for his last 30). His K rate has fluctuated throughout the year. In May it was at 42% but is back down into the low 20s now to go along with his ungodly walk rate, which in August is in the upper 20 percents. He’s going to be in Iowa next year and with his power potential (he has 14 HRs so far in 2018), he could earn his way to Chicago very soon. Check out this cool piece about Short by the greatest self professed scout ever. It sure seems like South Bend has been playing with 24 guys on the roster most of the year. In addition, for the past month, they have only had 2 catchers suiting up. Miguel Amaya gets the call behind the dish most days and Cam Belago, who is in his first year of receiving behind the plate, spells Miguel once or twice a week. Amaya, even though he’s just 19, has to be feeling the effects of catching 80% of the time. Hopefully, a third catcher will find their way to Indiana. They will need a new bullpen arm as Garrett Kelly is on his way to Myrtle Beach after last night’s game. The Tennessee starting rotation has been other worldly later. Every night, it seems like the starter goes 6 innings with 1 run allowed and strikes out 5-8 hitters. Keegan Thompson, Matt Swarmer, Michael Rucker, and Duncan Robinson might be the most under-reported story of the past six weeks. If not for one horrible start at the end of July, Rucker would have been pitcher of the month. Thompson was right there with him while Robinson is in his second month with a sub-2.00 ERA. Their success on the mound at AA should make things quite difficult for the powers that be next year as AAA should be swimming in quality starters. When it comes to the walking wounded, Bailey Clark is back on the bump. He made two one inning starts in Mesa this week. He is slowly building up his arm before he goes back to Myrtle Beach. One thing I really like to write in the second half of the year is a prospect profile. A lot has been happening in the system and I have gotten a few in, but not as many as I want. This week, however, profiles are filling the post docket and most of the them are about players in Eugene. In the past two weeks, I looked at Luke Reynolds and Grant Fennell. This week, Jake Slaughter gets profiled along with Andy Weber (hopefully) while Nelson Velazquez and Jose Albertos get updates. I’m not sure that South Bend making the playoffs is unlikely as you make it sound. We have a lot of games left against the teams we need to pass and the same teams are on top of the division as in the first half. The last team in from the East may have a losing record. It just depends on better clutch hitting and new pitchers coming in replacing the wealth of guys who have moved up or been traded. They are going to need a lot of help to get there.